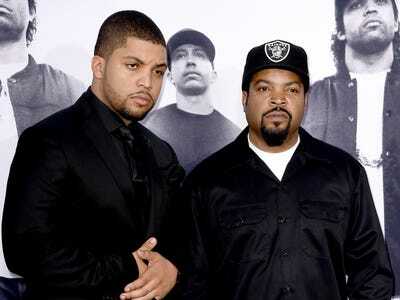 O’Shea Jackson Jr. is best known for being the son of Ice Cube. But that’s going to change soon. Since playing his father in the hit N.W.A. biopic “Straight Outta Compton” in 2015, the rising star has been keeping a low profile. However, it seems he was just waiting for the right role, and it finally came with the dark comedy, “Ingrid Goes West” (currently playing in theatres). In the movie, in which Aubrey Plaza plays Ingrid — a social media stalker who is obsessed with an Instagram star (played by Elizabeth Olsen) — Jackson Jr. plays Dan Pinto, Ingrid’s landlord and eventual love interest. With a role that could have easily been forgettable, Jackson Jr., 26, uses it to become the movie’s secret weapon. From his constant vaping to his obsession with Batman (specifically “Batman Forever”), Jackson Jr. elevates the movie’s comedy while showing audiences there’s a lot more to his talents than impersonating his father’s gangsta rap days. Jackson Jr. said a big reason why he hasn’t gotten the steady work of his fellow castmates from “Compton,” Corey Hawkins (“24: Legacy”) and Jason Mitchell (“Detroit”), is simply because he was looking for something different than what he was being offered. Kevin Winter/Getty Images(L-R) O’Shea Jackson Jr. with his father Ice Cube. In fact, it was Jackson Jr.’s fun personality that evolved the Dan Pinto role. “We realised we had this goldmine and we were just like, ‘How can we use this for the betterment of the story? '” director Matt Spicer said of casting Jackson Jr.
That led to Spicer and his cowriter, David Branson Smith, scrapping some of the things about the Pinto character they had in the screenplay, and tweaking it to better fit Jackson Jr.’s colourful personality. We caught a glimpse of that at Sundance. With a big wide grin and infectious laugh, he’s far from the introvert he depicted his father to be in “Straight Outta Compton.” And when our interview ended, instead of going straight to his phone as most, Jackson Jr. jumped up and walked over to where his costars Plaza and Olsen were doing interviews, and began making funny faces at them. The two couldn’t help but laugh while trying to answer questions. It might be a little while before we see Jackson Jr. in a comedic role again. He’ll next be starring in the bank heist movie “Den of Thieves,” and the sequel to 2014’s “Godzilla.” It seems his master plan is to try out all kinds of roles.